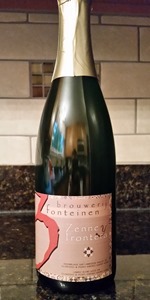 3 Fonteinen Zenne y Frontera is the latest creation of Armand Debelder, together with sommelier Andy De Brouwer of Les Eleveurs. The lambic was aged in 40-year old casks for 12 months prior to bottling. According to the brewery, this collaboration seeks to bridge the beer and wine worlds and is also aimed at drawing in the culinary sector. This bottle was split 3 ways. We each drank a 3oz taster pre-decanted, and then poured the rest into a decanter for approximately 35min. The difference from pre-decanted to decanted was huge. You must decant this beer!! The sherry that came through after the decanting was insane. The easiest way I can describe this beer is like drinking that 100 year-old cabinet sitting in the corner of an antique shop. That smell when you open the drawer, the dust, the muskiness, the earthiness...now set a glass of the finest sherry you can find in the drawer, and that's what this beer is like. There is no doubt that this beer would not be nearly as unique and balanced if the mentioned choice sherry barrels were not used. This beer is on it's own plain, and uncomparable to anything else out there. Big thanks are owed to ygtbsm94 for generously sharing this one with us. It is greatly appreciated Brad. Poured from a 750ml into a decanter and allowed to rest for 20-30 minutes prior to tasting. The brew appears a hazy golden color with a white cap that fades leaving spotty lace. The aroma got some serious stank about it like feta or tangy blue cheese funk but with an additional layering of fruitiness and herbal notes. All the while, it has some classic drie funk too and something along the lines of cinnamon as it breathes more. The taste has plenty of barrel nuance - oaky and earthen with enjoyable balance of crisp tartness and layerings of bacterial funk to herbal/citrus character and grass. Like the nose, I pick up on a light cinnamon-like spiced oakiness in the finish. This is medium in body with modest carbonation. It is juicy and a delicious brew that id love to drink again but something tells me this is too desireable and limited. Get some of this in your life while there is still a chance. 2014 vintage, poured into a decanter, at the Lambik-o-droom. Semi-hazy amber pour with a thin, velvety off-white head. Easily identifiable 3 Fonteinen lambic funk, green apples, mineral notes, light fruit oxidation, a bit of grapefruit, sherry (or I should say Oloroso), very light caramel, oak, light vanilla. Very interesting to have side-by-side with Oloroso and PX. Compared to batch 2 - Solera, this one is drier, much more funk-forward and a bit more oaky, as well. Very similar to the Armand & Gaston. Absolutely delicious, I think I prefer this just a bit more to the second batch, though it migh just be because of its age. Sampled at BXL Beer Fest and again at 3 Fonteinen Open Brewery Days. Semi-hazy orange pour straight from the bottle, and clear orange at the brewery, from the decanter. A thin white head. Notes of cognac, honey, lambic funk, grapes, white wine, whiskey, oak, light vanilla. Really complex lambic and sherry aroma, and close to perfect dusty, musty 3F funk. I feel like I need to drink a whole bottle by myself before I understand this beer. Smooth texture, medium carbonation, bitter-sweet and light sour finish. Beautiful splotchy orange - when decanted, almost seemed to swirl with pools of brown and orange irridescent bodies. The smell is over the top great, very sherry driven ... candied citrus, noyaux, almond, marzipan, hint of cocoa, minerality, sea air. Flavor follows but without quite as much pop. But, again, very sherry flavored. Folks that love this should really explore the world of dry sherries. Wow! This is now my favorite lambic. So much 3F lambic funk in your face. For some reason, the taste reminded me of a Mamouche (without the elderflowers). Very delicate. Perfectly aged for a rather recent bottle. This was quite a treat! Thanks to Brad for sharing. L: Hazy golden amber hue with great carb. We let this one decant for 30 to 45 minutes. S: Incredible. Smells very much like their Oude Geuze but with a sherry and amaretto quality. T: Taste is very much the same. 3F OG with some sherry and amaretto. It's hard to improve on their Geuze, which is my favorite geuze, but they've done it here in a way (since this isn't really a geuze, but it tastes very similar to OG). F: That perfect 3F feel. Full bodied and creamy with plenty of carb to support it. Carb was more subtle after decanting, but it didn't take away from the beer at all. O: It's perfect and may very well be the best beer I've ever had from them, or at least as good as 2011 Framboos in its own way. With that being said, I don't think it's worth the $400+ secondary price, or what it takes to trade for it. It is an improvement on 3F OG, but not enough to justify the price. Bit of funk with lots of oak and dry, slightly sweet taste of the sherry. The barrel is very present in this beer. Wonder how it will taste with a little age on it. Bottle at the original source. Consumed March 2016. Decanted first. Bottle in lambic basic. Served in proper glass. White head. Golden sunset color. In the decanter it has a pink hue. Drinking this side by side with regular OG. The sherry comes out right away. I have never tasted a lambic like this. It is very soft. The funk and sour comes next. Not overly acidic or harsh. Lemony with light vinegar notes. It is more rounded has less 'burn' than the OG does. It is citrusy and herbal/earthy. It is very clean and incredibly drinkable. Light bodied. Nice carbonation level. My favorite part about this beer is the sherry notes. It takes the gueuze(?) to another level. Very happy to have tried this one. Another bottle consumed December 2016. Decanted as well. Very similar flavor as it was in March. Love the sherry and the soft fruits. Funky and mineraly. Grapefruit citrus. Floral with perfume notes. A nice basket of fruits. Still wows me. Decanted and left to breathe for approximately 30 minutes. Light golden body with a small white cap. Lovely aroma. Soft, elegant, delicate sweetness. A remarkable beer. Simply lovely. Light sweetness and just effortless on the palate. World class. Big Poppy brought over this one for Slosh Fest 2015 a few weeks ago. Good fun gents! This was definitely a highlight of the day. APPEARANCE: Pours a small, medium looking white head with decent retention. Head slowly fades to a faint wisp and ring. Clear gamboge orange in color with no real carbonation evident. A slight wisp remains until the end and leaves dots of lacing down the glass. SMELL: Bold nose of funky and barnyard aromas, hay, citrus notes, lemon and lime, as well as some floral elements. Very forthcoming and enticing. TASTE: Soft, funky with citrus notes up front. Hay and barnyard flavors at the finish with sour lemon tartness as well. A milder yet persistent finish of citrus fruit, tart lemon sourness, funky flavors with barnyard and wet grass lingering on the palate. Some floral notes as well, adding a touch of bitterness. Really nice and void of any real musty character. Not acidic at all either. Really smooth and refreshing. PALATE: Medium body and lower levels of carbonation. Creamy smooth on the palate, goes down fine and finishes very dry. Some tart lemon lingers on the palate. OVERALL: This was a real treat. Absolutely delicious, soft and flavorful. Lots of funky notes and tart lemon and citrus qualities here, without too much musty, dank character. Absolutely not acidic at all either, which makes it very soft, smooth and easy to drink. Extremely enjoyable and would love to drink this again. Big thanks to Poppy for bringing this one over. Didn't think I'd get to try this one. Cheers! Amazing beer! The nose and taste had an exquisite balance of different cherry flavors. One of if not the best lambic I have ever had. Worth trying!